Last fall, Ryan Lupberger founded Cleancult to deliver nontoxic laundry pods to customers&apos; doors. Ryan Lupberger has never been afraid to take risks. At age 16, the Colorado native found a host family online in Costa Rica, convinced his high school to accept the local curriculum, and moved there for six months. He taught English at a monastery in Nepal over the summer of 2013 and became “wildly inspired” by social entrepreneurism after internships with SupporTED Collaboratorium and the Unreasonable Institute in 2014. 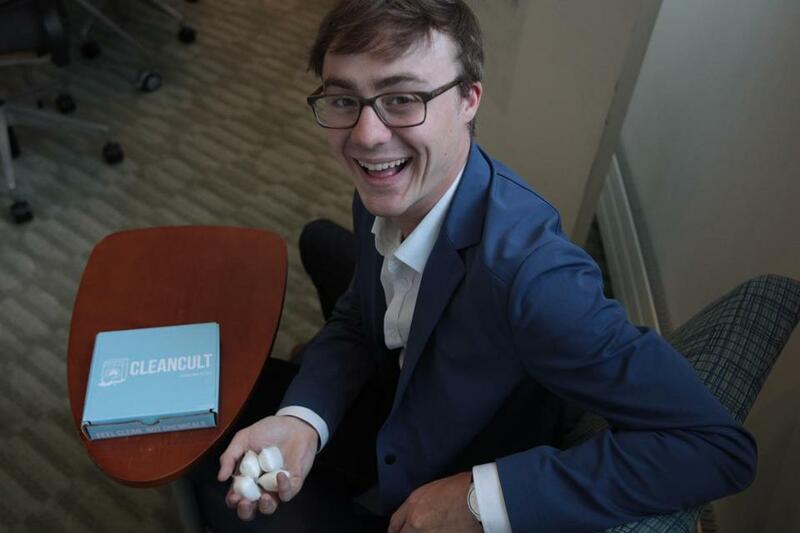 Still only 20, Lupberger and fellow Babson College junior Sam Gaudet of Northampton recently concluded a successful Kickstarter campaign to fund their new company, Cleancult. Lupberger had this to say about the venture, which delivers laundry pods to customers’ doors. Q. Of all the products you could develop, why did you select laundry pods? A. While doing laundry about nine months ago, I looked at the back of the bottle and was surprised that no ingredients are listed. That inspired months of research into the optical brighteners, phosphates, chlorines, dyes, and other harmful chemicals and carcinogens in so many detergents. The mission inspiring our business is to feel clean, not chemicals, from the clothes you wear to the sheets you sleep on. Q. How is Cleancult different from other detergents? A. Cleancult is the best solution for people with sensitive skin and allergies who need an effective clean without toxic cleaners. With conventional detergents, you have to rinse twice to get all the detergent out. With ours, it only takes one wash, which helped us achieve a score of 94 in stain removal on a 100-point scale from Sterling Laboratories, which compares to leading conventional detergents. Also, our product is made in the USA, with the detergent pods from California and the boxes manufactured in New York. Q. Where is Cleancult available? A. Customers can join the “Cleancult” by purchasing 20 pods at www.cleancult.com for $18, including shipping. Subscriptions are delivered monthly, bimonthly, or quarterly at a 20 percent discount. Q. How are you hoping to grow the company? A. We’re small now, but in a year or two, we want to offer a cumulative solution to household cleaning with a single box containing laundry pods, dryer sheets, hand soap, shampoo, toothpaste, cleaning wipes, and so on. Hopefully, we can continue introducing more products, and get them into stores, to help people eliminate harmful chemicals from their homes and lives. For more information, visit cleancult.com.